This tour is a great opportunity to see the beautifully illuminated sights of Milan by night and discover the lively Milanese night life. Start by enjoying a drink during happy hour and then party in the Navigli district. In perfect harmony with international trends, Milan was the first city in Italy to spread the culture of happy hour; a time for relaxation after work, to meet friends and colleagues, make new acquaintances and have fun! On your tour, you can enjoy a happy hour drink served with an apertivo (tapas style food) in one of Milan’s most vibrant nightlife areas, Corso Como, an area populated by both the Milanese and tourists who enjoy its cosmopolitan atmosphere. 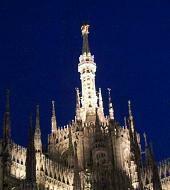 You will continue on a panoramic coach journey around the monuments of Milan. Admire the Duomo, Sforzesco Castle and La Scala theatre, illuminated by the magic of the night. The night will end in the Navigli district, a must if you want to experience Milanese night life. This area is famous for its bridges and canals which make it look like a miniature Venice. It is also packed full of bars and clubs to party until the early hours. Bus tour of famous landmarks and city's most popular nightlife areas.